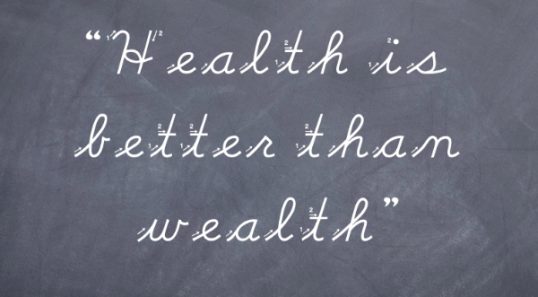 Health is Better than Wealth, Really? “Health is better than wealth” is the poor man’s motto. Unfortunately, it is what’s shared among the poor as a comfort for their lack of wealth. It is still taught in schools nowadays. “Wealth is better than health” does not work either. Why should someone choose between wealth or health and be contented with it? You will not hear the wealthy say that wealth is better than health, or that health is better than wealth. Having health, but no wealth is OK.
Having health and wealth is better. So, why not going for both? This is what should be taught to children in schools. You can easily agree that it’s better to be a wealthy sick man than a poor sick man. At least, you can afford paying for expensive medical care, have the choice of which hospital and doctors to see, and save your life in some cases. I could go further saying that wealth enables you to take care of the hospital bills of your loved ones, your family and good friends. It can enable you to make donations to an Hospital for sick children or the elderlies. Is being healthy, but not wealthy, help you do that?